Prior to New Direction Partners, Jim Russell was President and CEO of Arbor Press in Royal Oak (Detroit), Michigan. During his tenure at Arbor Press, the company was recognized as an eight-time winner of the National Association for Printing Leadership’s (NAPL) prestigious Management Plus Awards program that recognizes the best managed graphic arts companies in the country. Arbor Press was also recognized twice during Jim’s leadership as one of the 50 fastest growing printers in the country. 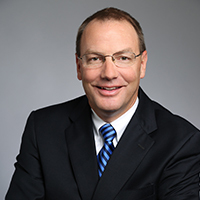 While serving as President of Arbor Press, Jim simultaneously served as President and CEO of RBF, Inc., of Lansing, Michigan, an industry leader in the document management industry. Jim has hands on experience as both of buyer and seller, having completed many different acquisitions and sales during the time he served as CEO of the family owned businesses. He earned a degree in Business Administration from Hope College in 1983. Jim also has served on the Board of Directors for the Michigan Chamber of Commerce, NAPL, and currently serves on the Board of the Printing Industries of Michigan, and Boards of numerous non-profit and faith-based organizations. Jim can be reached on his direct line at (610) 230-0635 ext. 703 or by email at jrussell@newdirectionpartners.com.